Dixter combination of Tulipa ‘Combat’ and Myosotis ‘Bluesylva’. taller E. palustris, which makes a vibrant backdrop to tulips of all colours. forget-me-nots and pale yellow Erysimum ‘Primrose Monarch’? hide them when they are over. Green walls: Function or fad? As cities and buildings all around the world are being covered in green, we take a look at the phenomenon of green walls. The first example of green walls may be found in the Hanging Gardens of Babylon, even if they may have been more roof gardens than green walls. Later, from Scandinavia to Japan, numerous civilizations used climbing plants to cover buildings, making what is now called ‘green façades’. Green façades were very important in the Art and Crafts and Modern style movements in Europe. For instance, in the beginning of the 20th century, the ‘Jugendstil’ movement used climbing plants (Parthenocissus tricuspidata) on the buildings to make a seamless changeover between the house and garden. In England, the Garden City movement showed great examples of green façades. William Robinson and Gertrude Jekyll designed outdoor vegetated rock walls used for screening & boundaries in gardens. You can still see such examples in Griftpark (Ultrecht, Netherlands). The use of climbing plants declined in the 30’s, due to new building techniques and people’s concern about possible consequences on wall stability. 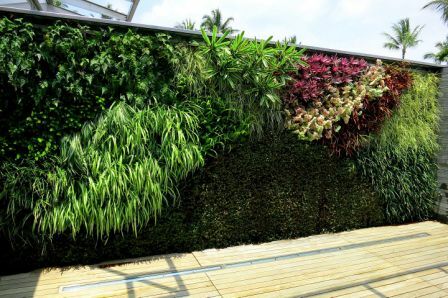 Patrick Blanc, a French botanist, is noted as the first to design the ‘modern’ pattern of green walls, with a full hydroponic system, an inert medium and numerous exotic species. His first green wall is at the Museum of Science and Industry. Let’s focus on living walls, also called ‘biowalls’, ‘vertical gardens’ or ‘Vertical Vegetated Complex Walls’ (VCW). The simplest way is to picture it as a cliff: the synthetic medium is the interface to which the cliff growing plant species can hang onto. The hydroponic system is often used to create a succession of dry periods and humid ones. One of the more important moments in the design process of a green wall is the choosing of species: you must choose plants which will grow straight and will have beautiful lower foliage, as they will be seen from underneath. The first living walls used tropical plants but the choice is now much larger. As more recent green walls create beautiful patterns, it is becoming a new urban art. They have multiple impacts on cities and citizens; they protect buildings from the effects of natural elements; they are introducing more gardens in urban areas and they can even be used to grow vegetables! Under sun exposure, a bare wall will contribute to heat conduction inside the building, making the internal building temperature rise, and contributing to the urban ‘heat island’ effect. But green walls, where the leaves of plants lose water through evapotranspiration, lower the surrounding air and building temperatures. Green walls also depress the cities temperature–they create a microclimate. The Tokyo Institute of Technology proved that green walls lower the energy loss of buildings. They also prevent the creation of urban dust (partly due to the effect of wind over buildings) and absorb heavy metal particulates from the atmosphere. walls are still newcomers in landscape architecture, and innovation is fast. They are invading new places every day. On bridges and roads, they can cover ugly or decaying concrete structures, such as in Mexico City. Every country invents new solutions to answer its own particular problems. In Canada, where winters are very long, green walls are placed inside buildings to help offset SAD (Seasonal Affective Disorder). We need gardens to be happier, even scientists have proven as much with the biophilia hypothesis. Let’s build some green walls to achieve this goal! One must not forget that as with every green space, green walls have advantages and drawbacks (such as using a non-biodegradable medium and often huge water needs) and must only be seen as part of the solution to make our concrete jungle cities greener.